This past fall I was running a number of trail camera projects concurrently. 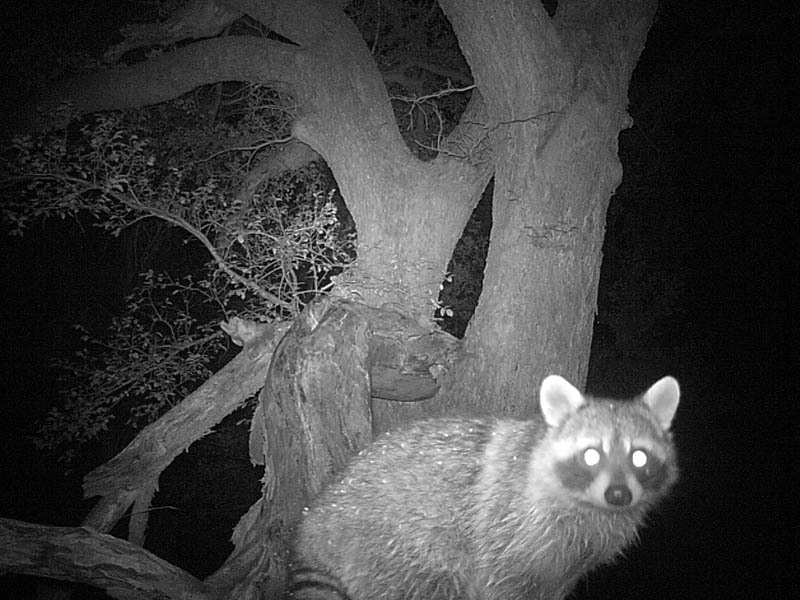 Trail cameras, for those who don’t know, are small battery powered units equipped with motion detectors and infrared lights for nighttime photography. 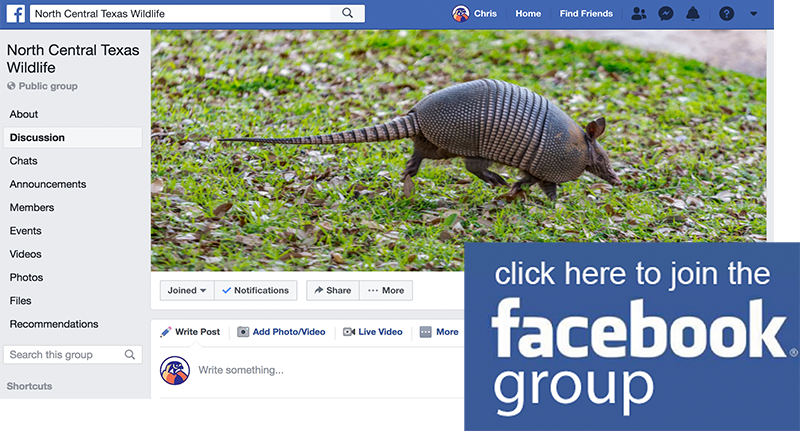 Hunters use them to scout out likely areas and to become more familiar with a game animal’s habits—I use them to find out more about what wildlife is doing in places I cannot frequent as often as I would like. When trail cameras are used in this fashion the pursuit is known as camera trapping, and it is a lot of fun. It is almost like opening a Christmas present when you get a first look at the sometimes surprising pictures that a trail camera can record. I had a couple of objectives for these sets, but one of the main goals was to get some idea about what, if anything, feeds on Osage Oranges. Osage Oranges are the fruit of the Bois d’Arc tree, and they go by many names. 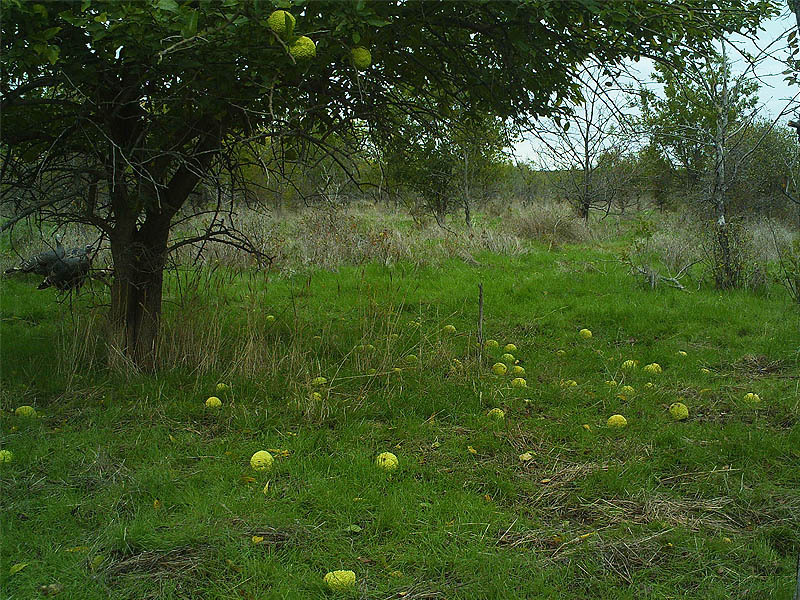 Hedge apples, monkey balls, and here in North Texas they are commonly known as horse apples. Some people wonder if these things can be eaten. I have heard the edibility of horse apples debated on a number of occasions, but I have never been present when a consensus was reached. All I know for sure is that if someone brought me some horse apple cobbler I definitely would NOT eat it! The fruit is not poisonous and humans can generally eat it without ill effects, but it is considered inedible due to the texture and taste, which has been described as chemical-like. Exposure to frost improves the flavor, which becomes cucumber-like. 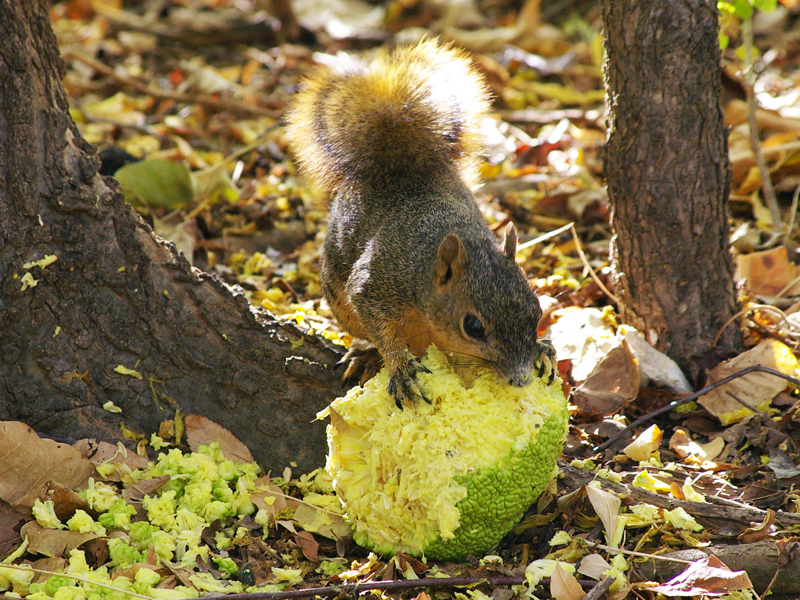 The seeds of the fruit are edible and it is sometimes torn apart by squirrels to get at the seeds, but few other native animals make use of it as a food source. This is unusual, as most large fleshy fruit serves the function of seed dispersal by means of its consumption by large animals. One recent hypothesis is that the Osage orange fruit was eaten by a giant ground sloth that became extinct shortly after the first human settlement of North America. Other extinct Pleistocene megafauna, such as the mammoth, mastodon and gomphothere, may have fed on the fruit and aided in seed dispersal. An equine species that went extinct at the same time also has been suggested as the plant’s original dispersal agent because modern horses and other livestock will sometimes eat the fruit. I have seen squirrels dining on Osage Orange seeds in the past, but I have never seen even horses feeding on the meat of the so called Horse Apple. Was there some kind of wildlife that feeds on these odd lumpy spheres? Hopefully my trail cameras would find out. I’ll share the results of this effort later in the week. But first there was the story of the hike from camera to camera which was quite eventful in and of itself. I made the drive to the survey area earlier one morning and arrived well before dawn. As I drove through the property I encountered a young male White-tailed Deer grazing in a field next to the road. 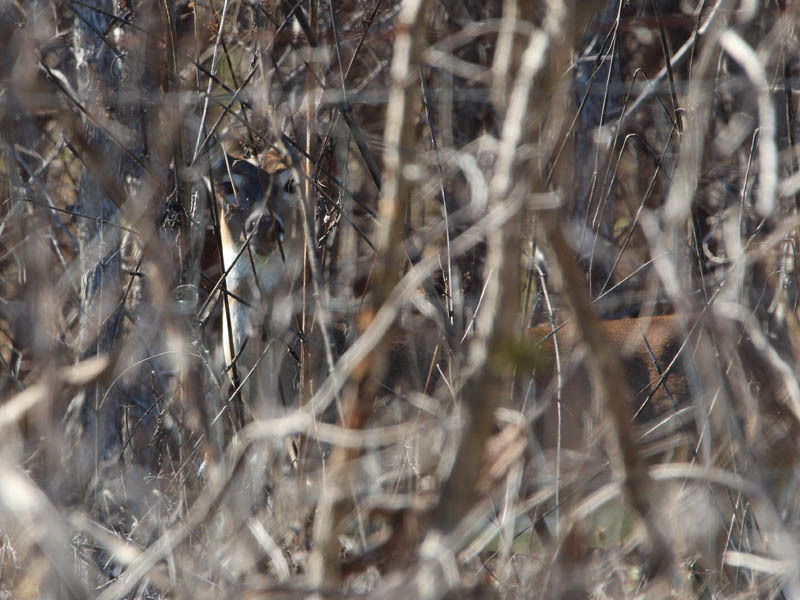 We were separated by only a barbed-wire fence and about 40 yards. As I approached the deer began to run down the length of the barbed-wire fence all the while staying parallel with the road. For kicks I followed along for a short distance. The deer was running flat out over uneven terrain. At one point I was doing well over 30mph and still was not closing the gap between us. Pretty remarkable! I slowed up to yield the right of way as we approached a change in the terrain. The deer bounded over the fence and across the road in two mighty leaps. Again, quite a sight to behold. I had set my trail cameras in every corner of the survey property. I placed one in the back corner of an old forgotten pasture now overgrown with a new Cedar Elm forest. Hidden in the back corner of the field was an opening in the barbed-wire perimeter—a one time gate that now acted as a wildlife funnel. A well worn set of game trails converged at this point and then fanned out again on the opposite side. There would be lots of wildlife traffic at this spot. In the bottomlands a little further in I found a tree with one of its major branches broken and touching the ground. This created a nice little ramp that small mammals were exploiting to access the crotch of the tree as evidenced by the abundance of droppings found there. This too was a promising spot to monitor with my trail cameras. Back to the north, I set up to survey a pair of Osage Orange trees about a mile distant from each other. At each location there was lots of fruit on the ground and plenty still on the branches. If something was feeding on horse apples these two trees would be the place to find out. I parked my car and started gathering my gear as the sun began to rise. 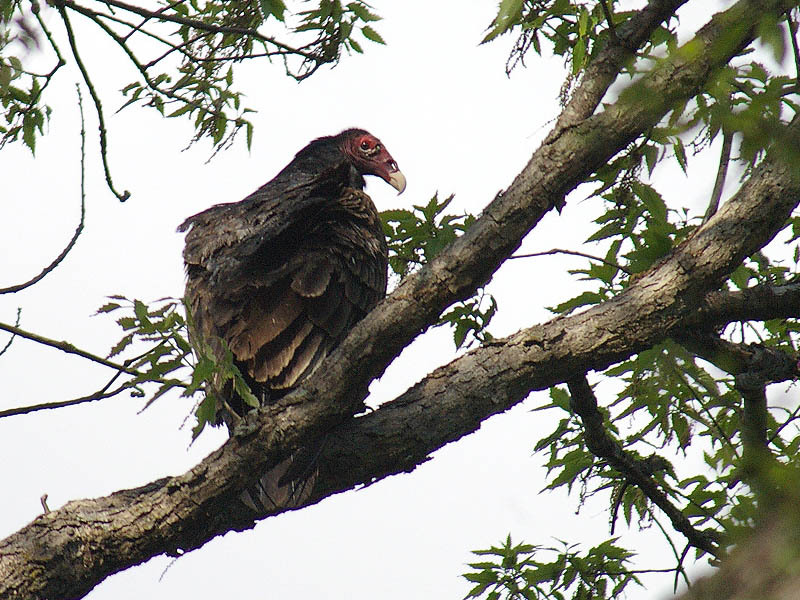 I was greeted by the sight of dozens of Turkey Vultures catching the thermals rising up off the surface of Lewisville Lake Dam. The birds had been roosting overnight and were now silhouetted against the vivid morning sky. A beautiful sight! 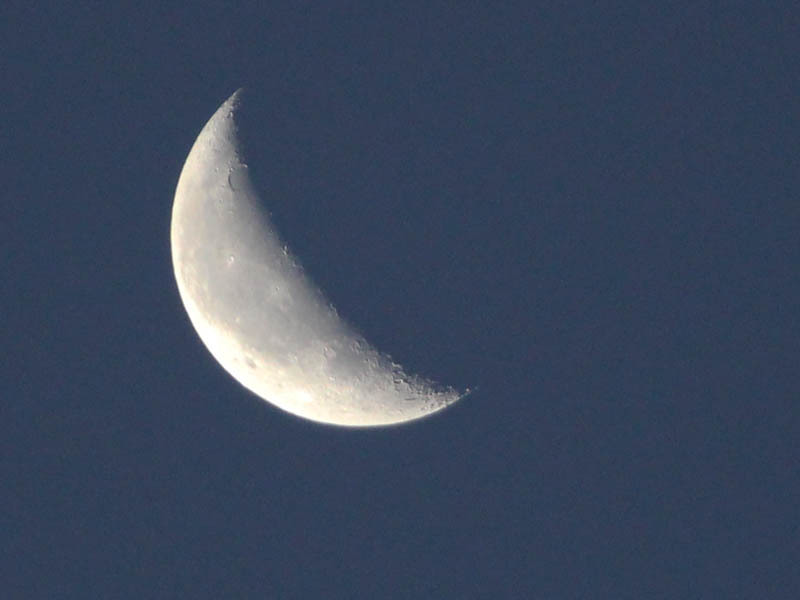 The waning crescent of the moon still hung in the sky as I began to make my way into the woods. The temperature was in the high 20’s and I was bundled up tight against the cold. A jacket, gloves, and cap would be necessary until the sun had a chance to warm things up a bit. My first wildlife encounter of the hike was a doe and her young fawn. These guys were very tolerant and did not flee when they saw me. We stood and watched each other for several minutes. The deer seemed determine to continue on their original route and were willing to wait patiently for me to move on in order to do so. Moments like these are very special, but I did not make the deer wait long before yielding the floor. As I approached my first camera set I spotted several Eastern Meadowlarks high in the perimeter treeline. 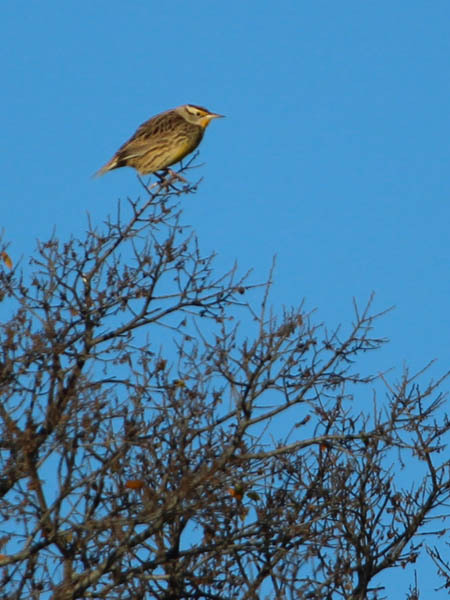 The meadowlarks did not let me approach very closely before they flew. They rarely do. I quickly took down my first set and then headed deeper into the woods. The next spot on the agenda was a bend in a twisty little creek where the tree with the broken branch was located. 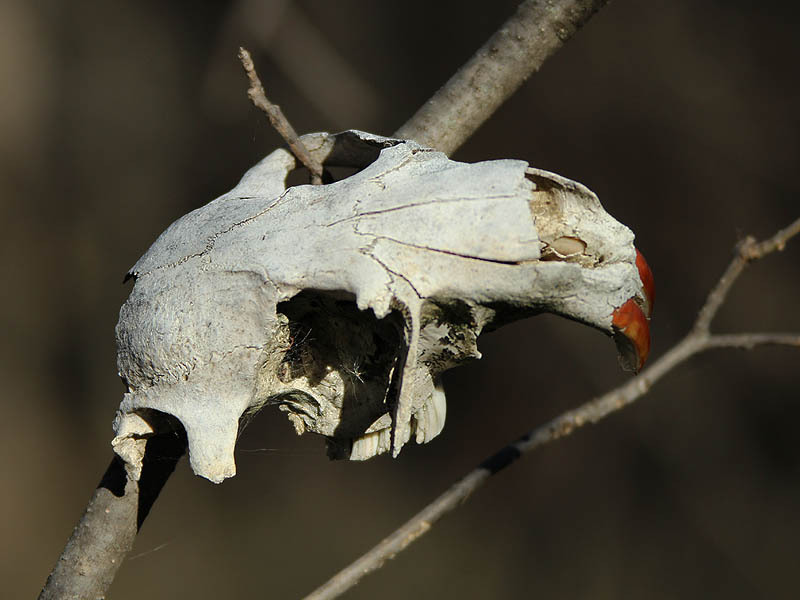 Along the way I found a Beaver skull hanging on a branch. This looks like my handiwork—something I might do for picture taking purposes. But I do not remember hanging the skull. Weird. Its hard to explain how it might have gotten there if I didn’t do it. There were no big surprises at this set. I took down the camera and checked the pictures only to discover it was all Raccoon, all the time. These little critters can become fascinated with trail cameras, and will work them over pretty well when they do. The cameras often end up pointed in funny directions at these times. This one had been directed skyward. Afterwards it was back to the north and the Osage Orange trees. 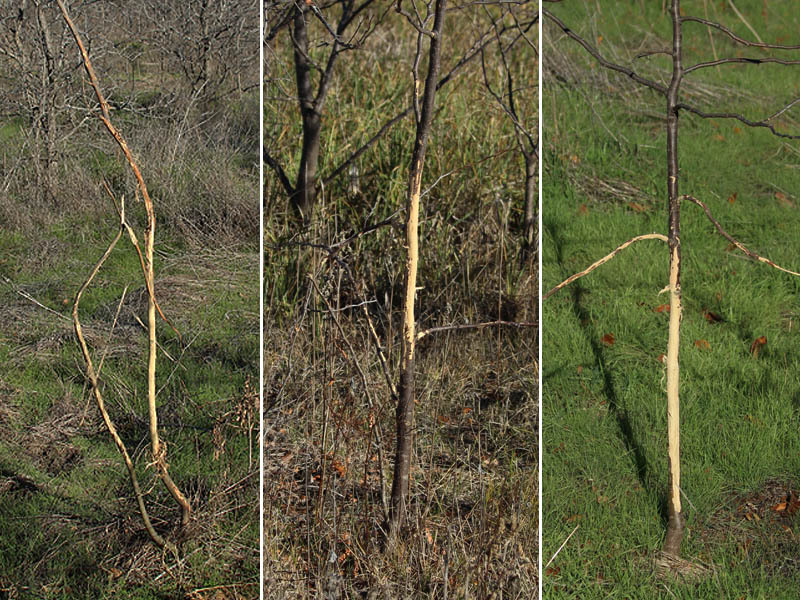 Along the way I came across a quite a remarkable number of deer rubs. Saplings worn ragged by the incessant rubbing of deer trying to shed their antler velvet. On some of the more well worn game trails I would encounter rubs like these every 30 yards or so. 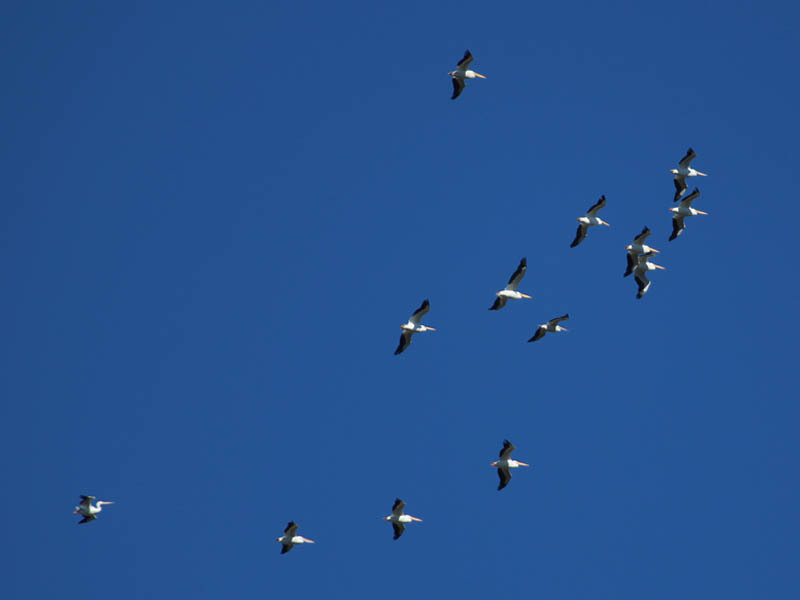 A migrating flock of American White Pelicans flew over as I reached the next trail camera on my route. This camera had also been tampered with by inquisitive wildlife, and it was pointed away from the Bois d’Arc tree when I arrived. I hoped there had been some time for recording pictures before it was moved. 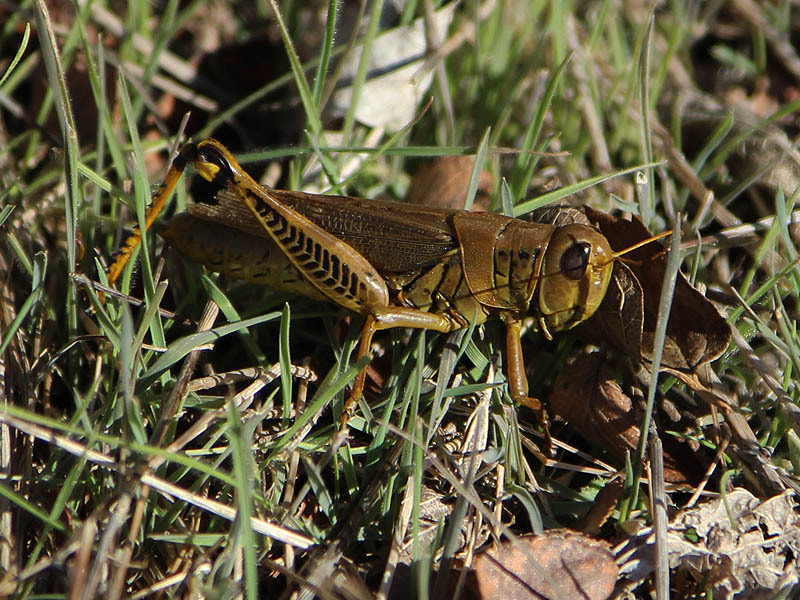 There are still a few grasshoppers hanging on at this late date in the season. These stragglers had somehow survived the recent cold snaps that had done in so many of their brethren. The Differential Grasshoppers started becoming active just before 11:00am. According to my phone, the temperature was still around 37F, but the sun was high in the sky and shining bright. It felt much warmer than that, and I had even shed my gloves, cap, and jacket by that point! 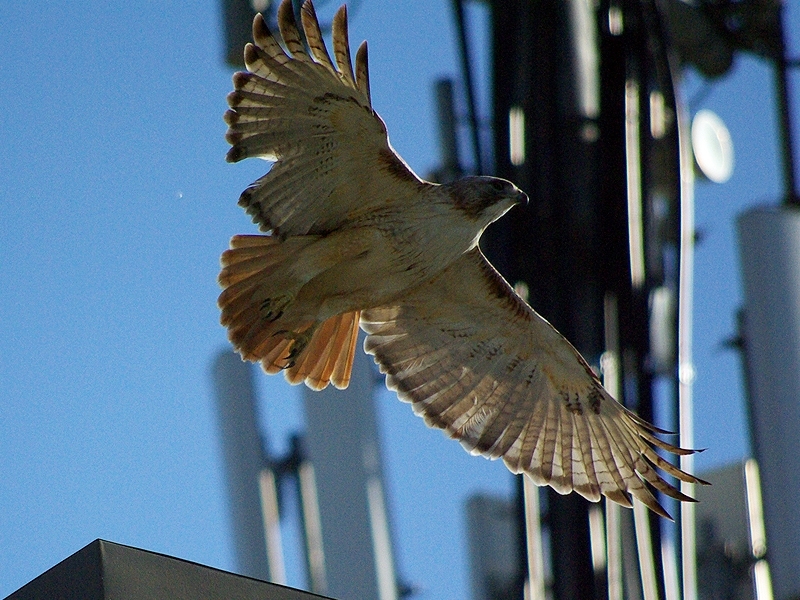 There was plenty of signs of wildlife activity at my last camera set. A partially eaten Horse Apple lay on the ground. The grass beneath the tree was matted and stomped. There had been a lot of action here and I couldn’t wait to review the pictures. But that would have to wait until after I returned home. 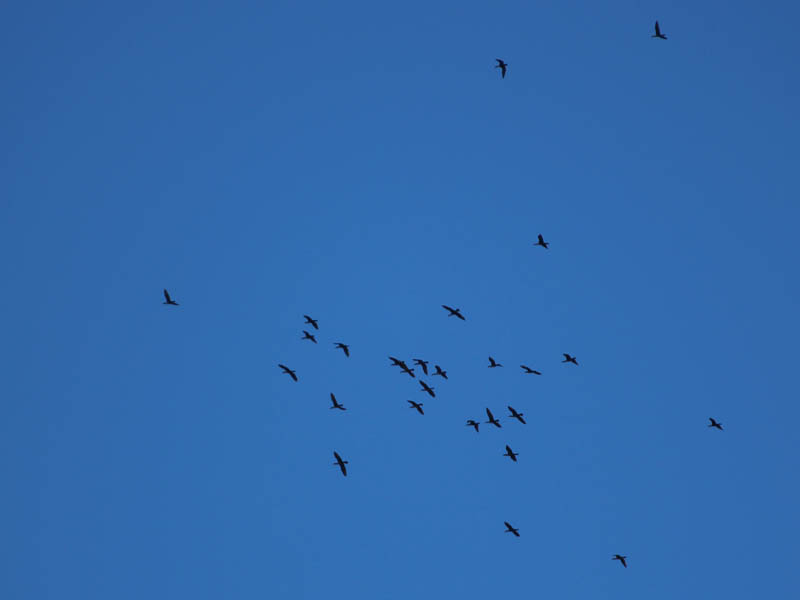 On the way back to the car I was treated aerobatic flyover by a large group of Double-crested Cormorants. 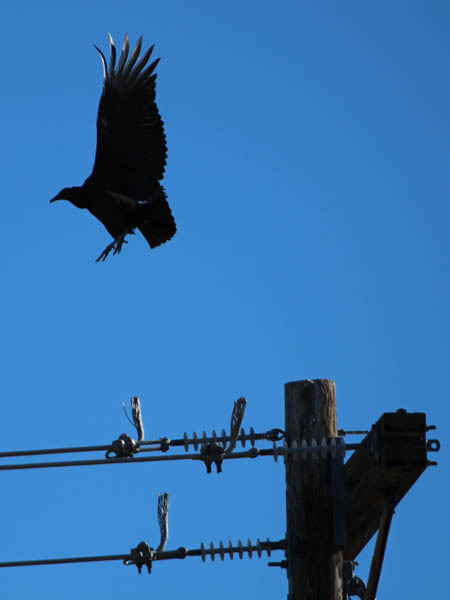 At the end of my hike I found this Black Vulture keeping and eye on things for me. I never worry about my car when I know Mr. Vulture is on the job. 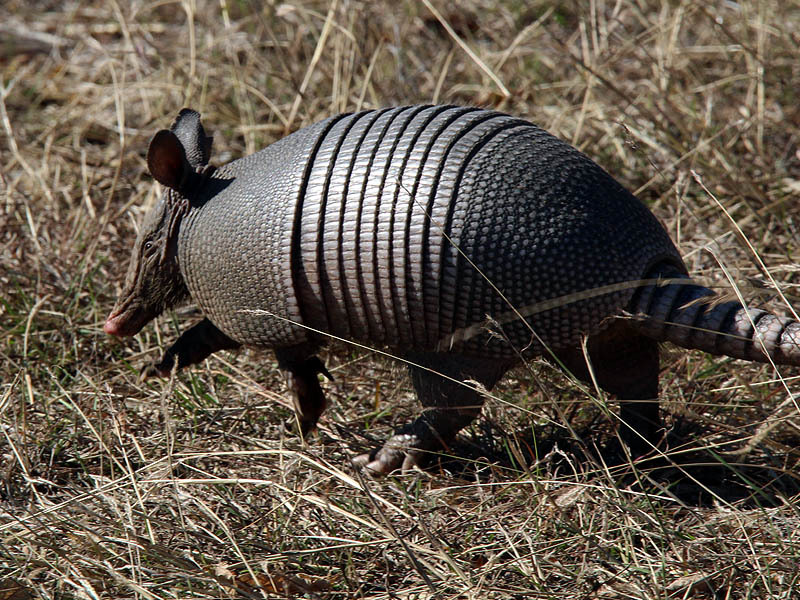 Of course that didn’t stop me from having to wait on this Armadillo who was foraging around my Michelin’s to finish up and move on. 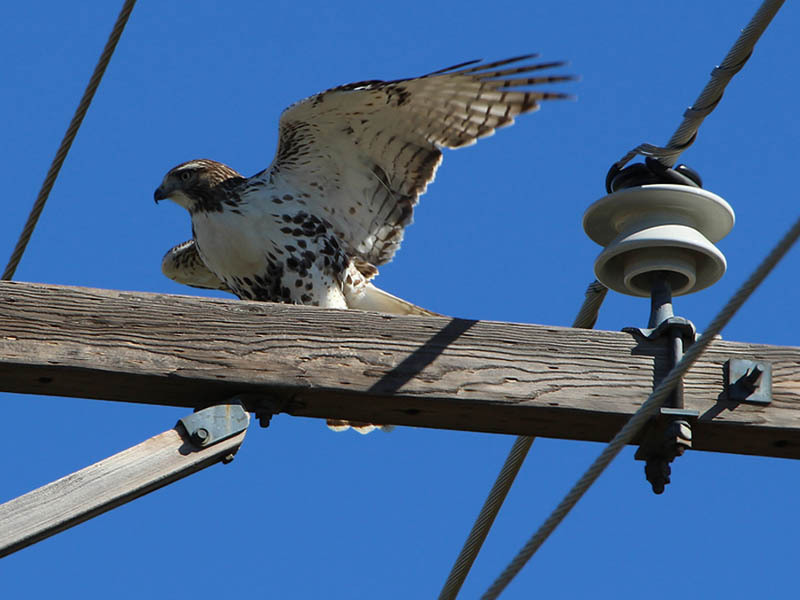 There must have been a a shift change because just moments after the Black Vulture left this find looking Red-tailed Hawk came in to take his place. 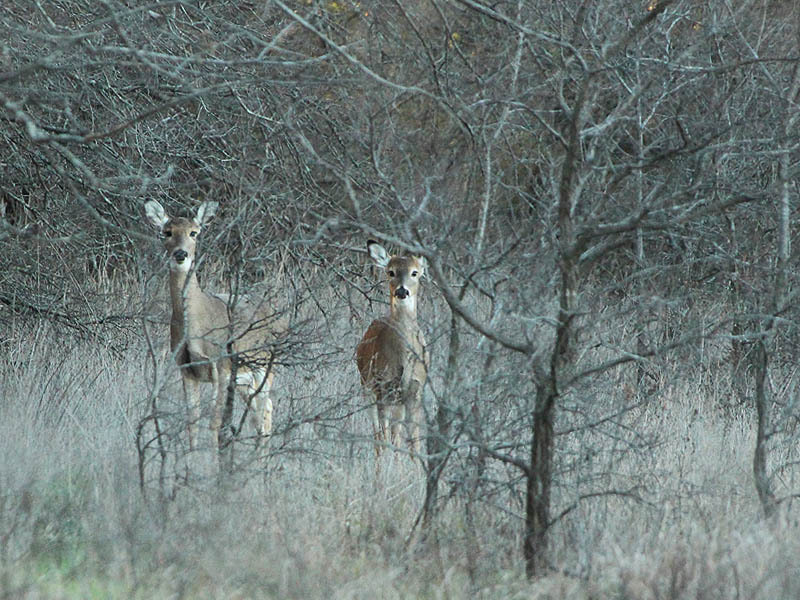 The White-tailed Deer on this property were still on the move late into the day. I had my last sighting when I was leaving at around noon. Can you see him in the picture below? Awesome post! I love the video of the vultures’ silhouettes against the backdrop of the morning sky.